Love Bailey Jean: July's Illustrated Faith Kit: Yes & Amen! *Please note, this post contains affiliate links, and I was supplied the devotional kit for free as part of the IF Launch Team. The links below won't cost you a cent more, just cover a Starbucks run or two for yours truly. Happy shopping! Another month means another Illustrated Faith kit! The July kit Yes & Amen premiered a week or so ago, and I'm already head over heels for Junelle Jacobs's writing and art. I mean, COME ON, just take a glance at that cover! I was swooning at first sight. Not only is the kit beautiful on the outside, but just like every kit that DaySpring sends our way, "How He Loves" is brimming with goodness and encouragement. What a blessing it is to work alongside these ladies, and it's a treasure to learn from them every month! Also, talk about timing! 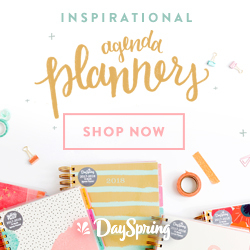 DaySpring is having a customer appreciation sale with 25% OFF the entire store! I'll include the discount code at the bottom. You're not going to want to miss this! You may recognize Junelle from from her blog, aptly named Yes and Amen. Her Instagram is full of smiling sheep and pretty florals, stunning sketches and adventures with her family. Her art workshops look divine, and I'm honestly mourning the fact that I can't ship off to Italy with her and Shanna Noel this fall. Bible journaling on the Italian coast?! What a dream! I love that Junelle's sheep and sketches made it onto the acrylic stamp set, too. "Yes & Amen" are front and center in the set, and I have a feeling those are going to get a lot of use this next month. *I'm not gonna lie, Andrea and I had a chat about what that sketch actually was. I definitely thought it was a fence, but she thinks it's mailboxes. Whatever it is, it's so stinking cute! Each kit comes with an Illustrated Faith ink pad, and the green this month is so rich! I'm typically a traditionalist, sticking to my black ink pad from a previous kit, but the green is gorgeous. It's a nice change from the brighter colors we've received in the past, and it will go great with the mustard yellow pad from earlier this year. Acrylic stamps are all the rage right now and for a good reason. Pro tip: (haha, or anyone tip really) I store my 4x8 stamp sets from the IF kits in a 6x8 binder using photo sleeves. They slip in and out so easily, and I can always find which one I need! I have a number of acrylic blocks in all sizes, and the standard block by Illustrated Faith works great with these kits! Another tip: if you misplace your stamping block (like I frequently do), just use the plastic lid of your stamp set. It totally works! The Yes and Amen kit wouldn't be complete without a roll of washi tape, and I love the type written phrases that are on repeat this go around! It reads "how He loves us" with a little heart, "go out in joy", and "yes & amen". I actually put the washi tape across the top of a blank white notepad then stamped "yes & amen" across the bottom to customize it even further. I love having this space for notes right on my desk or tucked in my planner. The washi gives it a bit of pizazz and personality, don't you think? I kept this page simple with the cut out and some labels from various kits ("Your amazing wild love" is from the Illustrated Faith Revival Workshop!) and finished the page with some journaling. Isaiah 55:12 was the first verse in the devotional, and it has held a place in my heart for quite some time. I highlighted it with a Faber-Castell brush pen and journaled with the Illustrated Faith precision pen. Finally, I dotted the page with enamel hearts by Bella Blvd. I use those things everywhere! My biggest question when I first heard about the kits was, what are the devotionals like? I'm pleased to tell you that they are a great combo of content, scripture, and space for reflection/creation. Day 1 was short and sweet, and the scripture of the day was written right at the top. We were left with a question for reflection, and I jotted down my answer on the lines provided below. I dated the page using the Illustrated Faith date roller and popped in a bit more washi tape to dress up the page. Each kit also comes with 3-4 scripture memory cards that can either be placed in your journaling Bible or used separately. I've been collecting mine all year long and I'm trying to come up with a special project just for them. I'll keep you posted when I figure it out! Currently they're tucked into an envelope I glued to the inside front cover of my journaling Bible for safe keeping and ease of use. I love the cutie gold mason jar pictured above, and there were MORE mason jars on the stamp backer! Hoorah! One of my favorite additions to this journaling Bible are the kit stickers on the back cover. Each of the Illustrated Faith kits released by DaySpring this year have come with a 2 inch circular sticker that echoes the design of the kit. Pictured are the stickers from the Yes & Amen kit and the You're Beautiful kit from earlier this year. I've been saving them but didn't know where to put them until now! I definitely foresee this continuing in future journaling Bibles to come. Speaking of which, I'm starting my SECOND journaling Bible for 2016 (my third total!) on Friday with the start of July! How crazy?! Speaking of crazy, I'm not kidding when I say DaySpring has a steal of a deal going on right now. They're having a customer appreciation sale which includes 25% off the entire shop! Just use the code THANKYOU at checkout and you'll feel plenty appreciated ;) Plus, a little birdie told me there's free shipping for orders over $50... just saying. Shop the sale HERE and pick up your Yes & Amen kit while the sale is hot! 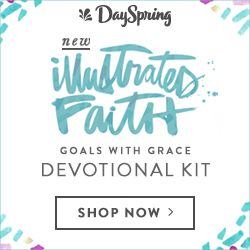 Have you played with the Illustrated Faith kits by DaySpring? If so, which one is your favorite? And just for fun, hat are you saying "Yes & amen!" to today? PS. There's a giveaway, too! Enter below to win an ESV Interleaved journaling Bible, the Genesis IF kit, and $100 to DaySpring. Go go go!